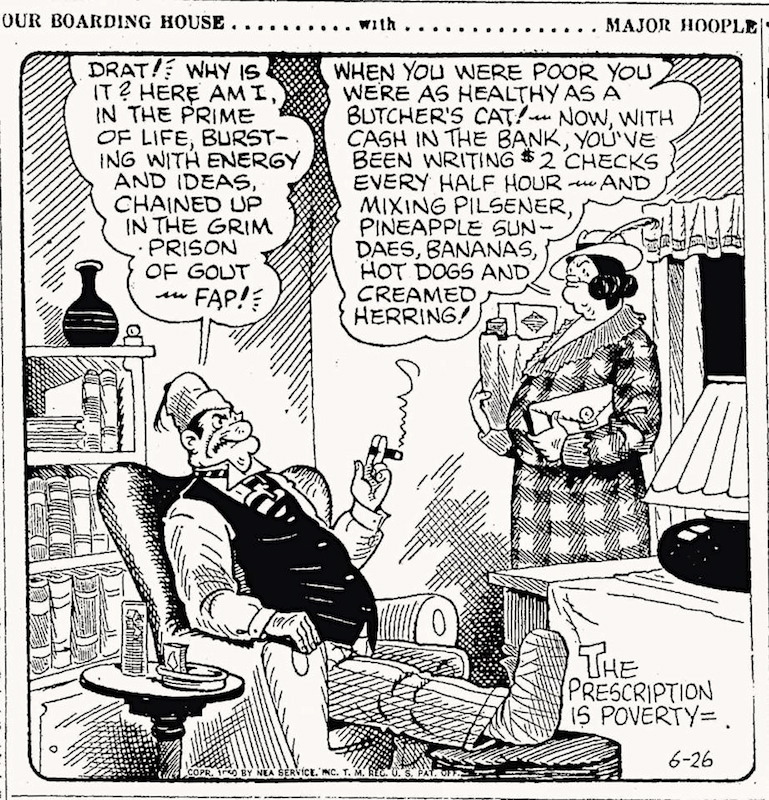 Our Boarding House was a long-running, American single-panel cartoon and comic strip created by Gene Ahern in 1921 and syndicated by Newspaper Enterprise Association. Set in a boarding house run by the sensible Mrs. Hoople, it drew humor from the interactions of her grandiose, tall-tale-telling husband, the self-styled Major Hoople, with the rooming-house denizens and his various friends and cronies. Martha scowled a lot, and ran her household the way a Sherman tank might run a stop sign; yet, her boarders, including Buster, Clyde, Mack and others who came and went, managed to hold their own in her presence. But [the strip] more likely owes its fame to one character in particular — Martha’s husband, Major Amos B. Hoople, perhaps the greatest windbag, stuffed shirt and blowhard ever to “hrumph” his way across the funnies page. It was four months before the Major appeared on the scene …, but he quickly took over to the point where many people today think his name was the feature’s title. Major Hoople had a huge, bulbous nose and an even huger gut. He sported a scraggly moustache and smoked rank cigars. He was seldom seen without a battered fez. In addition to near-archaic expressions like “egad” and “drat”, he was often heard mouthing such non-words as “fap”, “awp” and “kaff”. His favorite mode of expression was long-winded discourses about his prestigious and astonishing experiences, which nobody took seriously and only his occasionally-seen nephew, Alvin, even pretended to pay attention to. Well, not non-words, but exclamations, a word class with special syntax to go along with its semantics. There are pickled fish (pickled herring, for instance; pickled herring in sour cream is a great favorite of mine) and meats (pickled pork and beef) and eggs (pickled redbeet eggs were a staple of my Pennsylvania Dutch childhood), and lots of pickled vegetables besides cucumbers: beets, green beans, carrots, okra, onions. This entry was posted on September 10, 2014 at 9:41 pm and is filed under Linguistics in the comics, Syntactic categories. You can follow any responses to this entry through the RSS 2.0 feed. You can leave a response, or trackback from your own site. I have to say I particularly love “perhaps the greatest windbag, stuffed shirt and blowhard ever…”. And it also reminds me that just last night John and I were wondering about the origin of the (chiefly British) adjective “shirty” (“angry, irritated” — MW online); which he suggested might come from “stuffed shirt”. To RC: Green’s Dictionary gets it from “get one’s shirt out” ‘the derangement of clothes that may follow a fit of arm-brandishing fury’ (with quotes from 1859 on, even earlier for “shirty”).